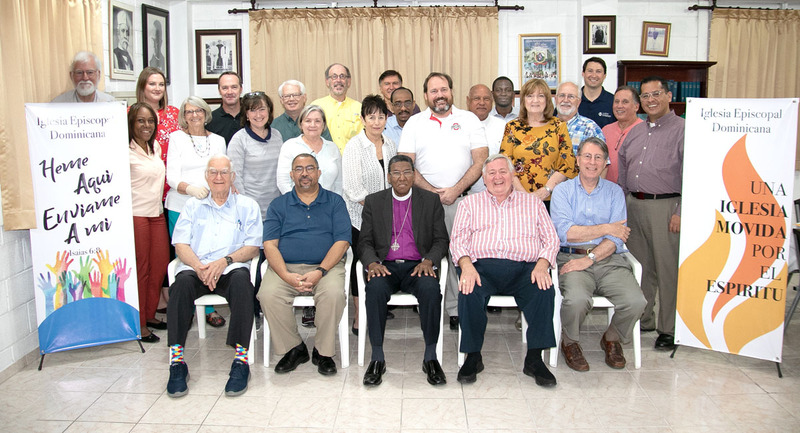 The twenty-five board members and guests from twelve dioceses at the meeting of the Board of Directors of the Dominican Development Group in Santo Domingo on February 11, 2019. From left to right, first row: The Rt. Rev. William J. Skilton (Dominican Republic); the Rt. Rev. Wendell N. Gibbs (Michigan, Second Vice-President); the Rt. Rev. Moisés Quezada Mota (Dominican Republic, First Vice-President); the Rt. Rev. Michael Garrison (Southwest Florida); the Rev. Ed Miller (Virginia, President). Second row: Patricia Martin (Dominican Republic); Debbe Causey (South Carolina); the Rev. Deacon Beth Drew (Western Michigan); Joy Holl (South Carolina); Sally Thompson (Southwest Florida); Bill Kunkle (Southwest Florida, Executive Director); Karen Carroll (Southwest Florida); The Rev. Ricardo Lopez (Northwest Texas). Third and Fourth rows: Julius Ariail (Georgia); Katie Forsyth (Eastern Michigan); the Rev. Jason Roberson (The Episcopal Church in South Carolina, Secretary); the Rev. John Schaefer (Nebraska); John Gruetzmacher (Tennessee); the Rev. Marshall Huey (South Carolina); the Rev. Deacon Alexander Romero (Dominican Republic); the Rev. Canon Juan Màrquez (Dominican Republic); Miquea Saintivil Luis (Dominican Republic); Tom McGowan (Nebraska); Michael Sosnowski (Water Missions - Charleston, South Carolina); Charlie Nakash (Dominican Republic). The Board of Directors of the Dominican Development Group met in the Bishop Holly Conference Room at the diocesan office in Santo Domingo on Monday, February 11, 2019. Information about this meeting and reports distributed there are being posted on this page they become available.